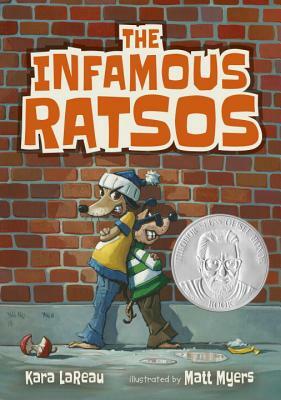 Louie and Ralphie Ratso are determined to be as tough as their truck-driver father, but the rats’ efforts go hilariously awry in this funny, thoughtful, and smart chapter book...LaReau packs substantial comedy and poignant emotion into each chapter (the boys’ mother has “been gone for a little while now”), adeptly amplified by Myers’s spot art. LaReau keeps the action high and completely appropriate for readers embarking on chapter books...The humor springs from their foiled efforts and their reactions to their failures. Myers' sprightly grayscale drawings capture action and characters and add humorous details, such as the Ratsos' "unwelcome" mat. A nicely inventive little morality "tail" for newly independent readers. The father-son dynamic is realistic and honest. Young readers will feel for the family as they learn to deal with the absence of a loved one. This slender novel packs a strong message of overcoming loss through love and kindness. A solid purchase; a chapter book that entertains and uplifts. Generous black-and-white illustrations evoke setting (a rundown city neighborhood) as well as reinforce the storyline and the light tone of the text, with its natural vocabulary. Here’s a beginning chapter book with heart. Action and real emotion are packed appealingly into this rumbustious tale for readers ages 5-8.